BUFFY FORD STEWART dedicated her new album, “Same Old Heart,” to her late husband, the singer-songwriter John Stewart, and Davy Jones of the Monkees, who died unexpectedly of a heart attack not long after singing with her on her record. 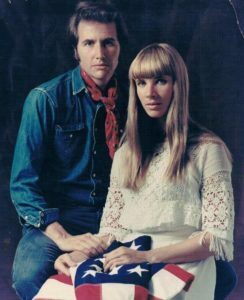 For “Same Old Heart,” she and Jones sang “Daydream Believer,” a song John Stewart wrote just before he left the Kingston Trio. It became the Monkees’ last No. 1 hit in 1967. Released by the Petaluma-based label Global Recording Artists, her new solo album comes five years after her husband died of a stroke at the age of 68. Mementoes of their life together are everywhere in the cheerful Spanish-style house she moved into after his death. The walls are decorated with his paintings and artwork, and there are many photographs of them when they were a beautiful young couple making music and raising their son, Luke. They were together for 43 years. One of the songs she wrote for the CD, “Find Your Shoes,” is about fighting through the debilitating grief she suffered after his death. They met when he was leaving the Kingston Trio and was looking for a female singing partner. After he came to see her in a musical comedy show at the Festival Theatre in San Anselmo, he offered her the job. They recorded the 1968 album “Signals Through the Glass,” featuring “July, You’re a Woman,” a song Stewart would later re-record on his famed album “California Bloodlines.” They also recorded one album with Darwin’s Army, a short-lived band they formed in 1999. For this, her first solo album, Ford Stewart chose a mix of her songs and her husband’s. In addition to Davy Jones, guests include Rosanne Cash, Kris Kristofferson and Nanci Griffith, all old friends. For her, though, the album is about more than music. It represents her triumph over an unbelievable series of life-threatening illnesses that have plagued her over the past decade and a half. In 1996, she underwent brain surgery to remove a tumor that affected her optic nerve, causing her to lose the sight in her left eye. When she performs, usually in flowing white gowns that complement her long blond hair, she wears a black eye patch that has become something of a trademark of her’s for her onstage. 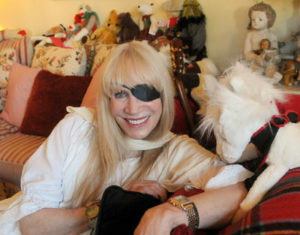 Singer-songwriter Buffy Ford Stewart poses for a portrait at her home in San Anselmo, Calif. on Friday, Feb, 8, 2013. (IJ photo/Alan Dep) Alan Dep When a second brain tumor subsequently appeared, she had a successful gamma knife (radiation) operation, but it left her with excruciating nerve pain on one side of her face that she and her doctors have learned to manage. “My brain surgeon says it’s a miracle I’m alive,” she says. Three years later, she got more bad news: She had breast cancer. She opted for a mastectomy. Her health problems still weren’t behind her. A former dancer, she had to have both hips and a knee replaced. She has to go in for periodic checkups, but is now cancer free. In addition to traditional Western medicine, she credits her spiritual beliefs with helping her overcome her long siege of illnesses. “I have a lot of faith,” she says. And now she has this fine new album, and the healing power of its music.